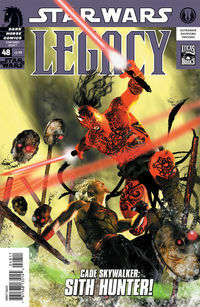 So much action and plot in this issue, it’s nearly impossible to think of anything to say other than..
Cade is one serious Sith hunting machine now – he is the ultimate sith/jedi hybrid and we doubt there is any force in the universe that can stop him now. And the biggest surprise on the last page of this issue…the man that created the new Sith isn’t dead after all…then again did anyone of us really think he wouldn’t return?? Star Wars Crosscurrent by Paul Kemp – the short review is that this is an awesome book. We get multiple timelines 5,000 years ago with Jedi and Exar Kun era Sith, colliding with the post Darth Caedus era. 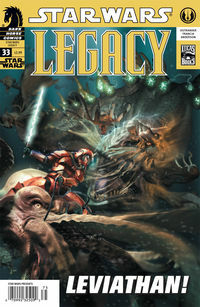 We also get the first mention of Darth Krayt outside of the Star Wars Legacy comics that we know and love. The structure of having multiple plots come together is the Star Wars formula and Kemp follows it well. The Jedi Jaden is a decent but troubled Jedi and it’s easy to see his parallels with the ancient Jedi. The ancient Sith Saes is another cool character, though it’s a shame we won’t get to see more of him. The Anzat ‘soup drinker’ character was a bit weird and didn’t quite fit in, but still that didn’t detract from a great story. And oh yeah, Jedi/Sith hybrid clones are on the rampage. Great stuff. From beginning to end, this book held our interest with a combination of great plot and interesting new characters. After all he’s been through, Cade Skywalker is still scum. He defeated Darth Krayt, was hailed as a savior of the Jedi Order and maybe even the Galactic Alliance itself but in the end Cade is a troubled man. When we first met Cade way back in the first issue of this series he was hiding who he was and living out his life as a bounty hunter. Then over the course of the last three years he has revealed who he really is, his friends have found out who he really is but none of that matters. At the core of his being Cade Skywalker is bounty hunter scum. 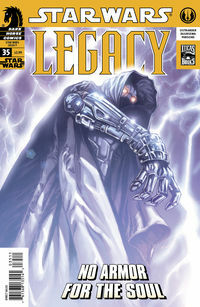 In this issue he ends up starting a bar fight and nearly turns to the dark side to kill his cousin. It’s his nature. Cade is no Jedi hero. He is a Skywalker but he is not the heir to the Luke Skywalker legacy. That’s fine by us and what makes Legacy one of the best Star Wars storylines of all time. It would have been easy for this series to be just about the transformation of Cade from bounty hunter to Jedi hero. But life is never that easy and neither is this series. It’s a complex series where heroes are villains and there are no clear answers. At the end of this issue, Cade returns to the life he had where this series began. A disreputable scum bag on the run. 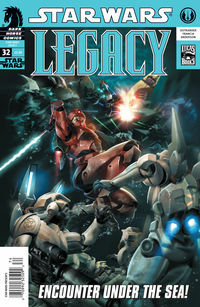 Star Wars Legacy is the best star wars comic series of all time – and it just keeps getting better. After a little hiatus we’re back to the main plotline – where Darth Krayt is dead – or is he? Somehow I think we will see him again. Really cool to see Darthy Wyyrolok and his DAUGHTER Saarai. 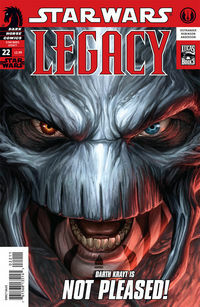 Lord Stryfe – the dude on the cover – is clearly in for more panel time too and he’s one mean Sith. And what about Azlyn Rae ? Going into a Vader type suit? Cade is going to go nuts!!! Awesome art again from Omar Francia. The AT-AT swimmer? come on that was kriffing incredible. The plot as always was solid – here we are finishing this little story arc that began in issue 32. Just when we think the Imperial Knight will go home to his emperor..he turns a bit to stay and defend the mon cal! what a great angle and a solid knight to boot. More importantly we finally get the continuity link we’ve been waiting for the past three years for Roan Fel. The first Emperor was Jagged Fel – yup i’d assume that’s the same Jagged Fel that was hooking up with Jania Solo. So Roan Fel is likely a Solo grandson!!! How’s that for a twist!! Though this is Jan Duresema’s art (wasn’t last time the Mon Cal were center stage either)..Omar Francia has done one of the most awesome covers and his interior artwork is AMAZING. SeaTroopers? wow!!! makes good sense but we’ve never seen that before ..
And what’s up with an Imperial Knight helping out the Mon Cal? Sure we didn’t have Krayt or Cade in this issue..but after Vector , i think they all deserve a rest. It’s not like the rest of us are suffering either…with a new awesome storyline here – Legacy continues to deliver THE BEST Star Wars stories available anywhere today. No – not Vector in general – but this issue in particular was hands down – INCREDIBLE. It really finished off the plot elements first laid out in part 11 last month. After 12 issues spanning the entire Dark Horse Star Wars canon Vector comes to an end – but the Vector angle and the Muir Talisman is almost a side-show in this final issue of Vector isn’t it? Cade is so powerful in the force that Muir lasts what? One frame? Then he’s toast. Does that make Cade the most powerful Jedi in 40,000 years?? Too bad for Celeste Morne though – I was kind of hoping that she would somehow survive – but what was that about her thinking that Zayne Carrick sent Cade for her? Nonsense! And poor Azlyn Rae – will she be healed? But the biggest plot dev by far – and the only one that makes Vector as a series worthwhile is the defeat of Darth Krayt. I did not see that one coming – nor did I see Darth Wrylock’s deception either – then again that’s the Sith way isn’t it? Will Krayt return – i’d say it’s 50/50 at this point..but at least Vector is now done so we can finally get on with the rest of the Star Wars universe! As a loyal Dark Horse reader – i would have read all the titles anyways. I’m not sure that it pulled in new readers – but it was neat to have some small link spanning all the Star Wars titles. In the end though, Vector fell apart and the AWESOMENESS of Legacy just blew it out of the water. Darth Wyyrlok is one mean Sith dude. We haven’t seen much of him to date but this issue changes that with an entire issue dedicated to him and what an issue it is! 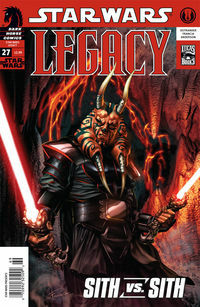 Darth Wyyrlok proves he is more powerful than an Ancient Sith using the Force alone – awesome!! We also learn of his unwavering loyalty towards Darth Krayt which no doubt will also play a role as the story progresses…Oh and hey Darth Talon (aka The Sith HOttie) isn’t dead and is coming back!! All this and next issue Vector finally hits its stretch run finding it’s finale in the best Star Wars series ever created…should be a real rush. Just when you thought Star Wars Legacy couldn’t get any better – or more complex – it does. Uncle Nate Skywalker just added a whole new dimension. Cade kinda/sort looks like Uncle Nate and it’s kinda cool to see that Cade isn’t the only Skywalker of the Legacy era to have gone the rough and tumble route. 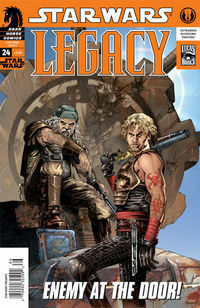 There was no indication whatsoever at the end of Legacy #23 that Nate was a Skywalker or Cade’s real uncle. Oh and a nifty new former ‘beau?’ from the Jedi Academy who is really an Imperial Knight. Wicked cool stuff. It looks like we finally might see Cade come face to face with the Princess and (maybe Roan Fel too) after what seems like a 14 issues hiatus. And yes Legacy is still awesome. Great to see Cade return to his bounty hunter friends — he is not a Jedi and he’s not a Sith. Cade Skywalker is the Han Solo of Skywalkers..he’s rough and he speaks Huttese. Nice to see that Darth Talon isn’t dead yet either (she’s the hottest Sith ever) though that was just a one cell image with her in the bacta tank so it’ll take some time till we see her again. Nice to see Roan Fel and his daughter — that’s a storyline that has been neglected for what…a year at this point? So much going on in this series it’s hard to even begin to speculate what comes next but just seeing each of the pieces moving around is fun. And last but not least, Jan Duursema the finest artist in the expanded Star Wars universe is back! hurray. Kill all the Mon Cals? a bit extreme even for a Sith. 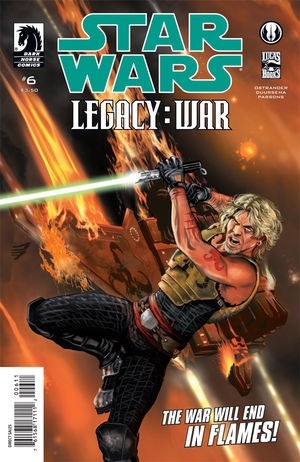 A real solid plot driving story for the wider (no Cade Skywalker) Star Wars Legacy story…and great to see the GA and Roan Fel’s empire perhaps link up to take on Krayt’s empire. Art in his is ok, but not great by Legacy standards… I can hardly wait till Jan Duresema comes back. for that matter i can hardly wait to see what’s going on with Roan Fel..or his daughter! How many issues has it been since we saw them last? But soon…soon all will be revealed (or at least we hope it will). This is the story arc that we had been waiting for ever since Legacy first hit the stand and boy did it deliver. 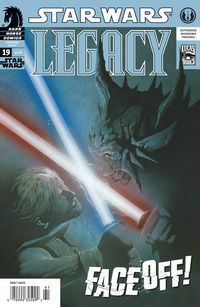 Cade face to face with Darth Krayt (whose identity is finally revealed) as the last Skywalker decides whether or not he will follow Vader to the Dark side. Finally his friends come to the rescue and for the first time in more than 6 issues, Cade is back on the Mynock. 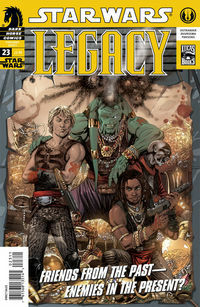 The last 17 issues of Legacy have been awesome and issue number 18 continues that tradition. 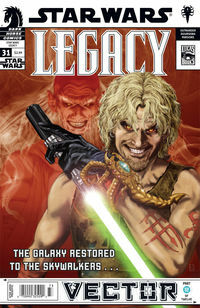 We finally learn of the link between Darth Krayt and Darth Caedus – the critical link that connects Star Wars Legacy with the New Jedi Order and Legacy of the Force books. It’s a fine link – essentially Vergere – the same Jedi creation that changed Jacen Solo did the same kind of thing to Hett/Darth Krayt while onboard a Vong Cruiser. The Sith that are hiding out on Korriban in the time of Legacy of the Force (that Lumiya and Alema Rar knew) are the same as Krayt’s Sith…hurray! Anything else likely would not have made sense and would have messed up continuity and canon. Beyond the end of Darth Krayt explaining how he came into being..we see the Vong’s Embrace of Pain (yup that sucker) but as opposed to Jacen Solo (and maybe Ben Skywalker too?) it doesn’t mess up Cade…too much (yet). 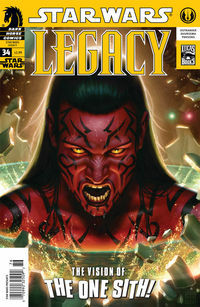 Perhaps most importantly though…Cade sees a vision of his Dad – Kol Skywalker – and rejects the Sith – fighting his way out and killing (or so we think) the Sith hottie herself..Darth Talon (yeah her…the awesome Twi’lek that Cade hooks up with and the same that is on the cover of issue zero of Legacy. 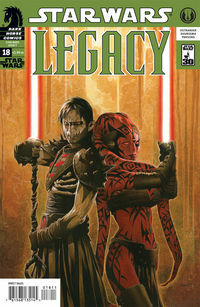 Again the artwork is sheer brilliance and is the best of any current ongoing Star Wars series. Oh and what about Roan Fel and his daughter? Lots of stuff for us to get caught up on…and then of course there is Vector….man oh man…if Legacy was a weekly series i don’t think it would be enough!! Is Darth Talon really dead? We’ll see…one thing is for sure, i don’t think she’ll easily be forgotten.